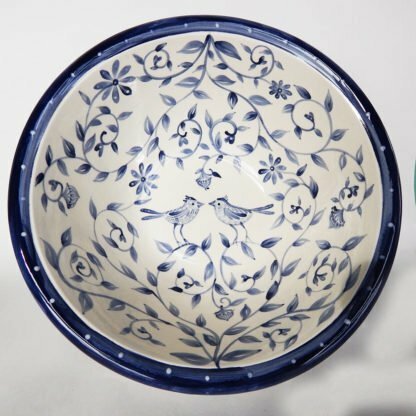 The Delft Blue Bird bowl wishes your love birds happiness. 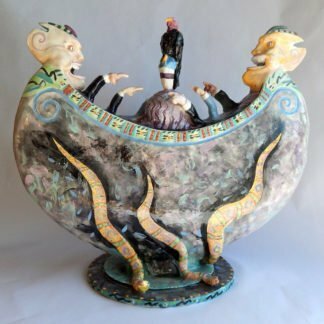 It is may be customized for weddings or an anniversary gift or just as a great bowl to have. 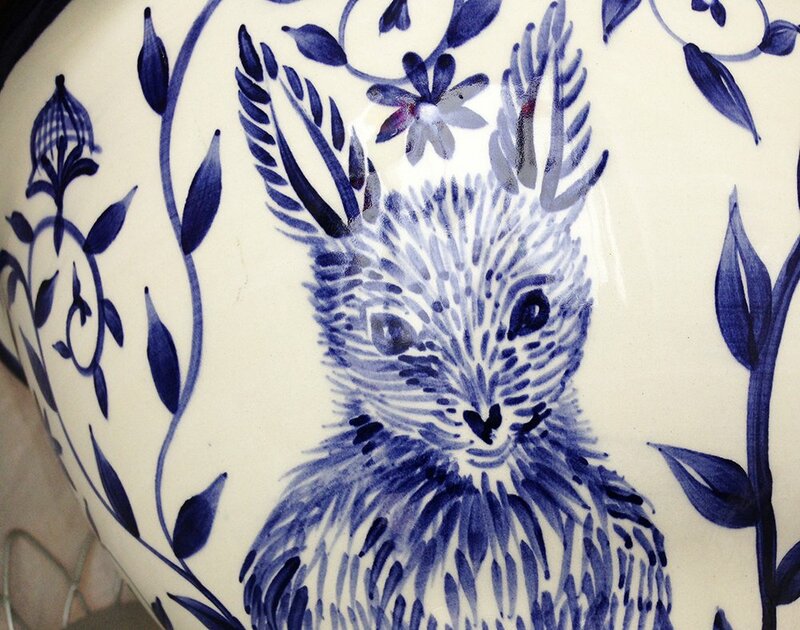 Each bowl is rendered freehand in cobalt blue underglaze. The outside has two rabbits, one sitting another hopping with vines and flowers flowing around them. On the inside the floral design surrounds two birds facing one another signifying a happy marriage and love that grows. 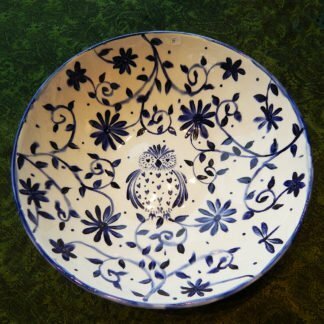 Bowl is about 13 inches across by 6 inches deep- excellent for salad, pastas or a pile of fruit. All our dinnerware is Food safe. You may choose complimentary Gift card from my designs. 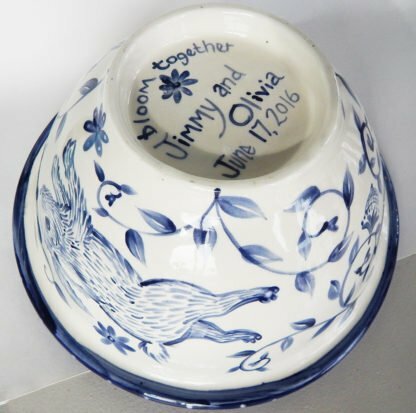 I am happy to personalize a bowl for you with the bride and groom’s first names and wedding date on the bottom or any other short phrasing you might like. Figure 2-3 weeks for custom- you need one quick or without lettering – We try to keep some finished un-customized ones in our store that we can ship right out. Our custom wedding bowl Happy Nest is a perfect wedding gift to wish your love birds a long and happy marriage. 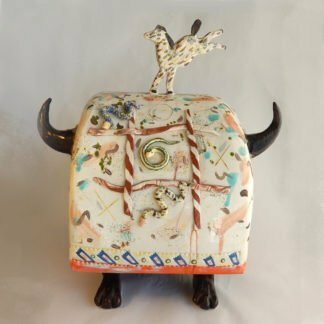 It may be customized for weddings or an anniversary gift. Each bowl is hand painted in cobalt blue brushstrokes. 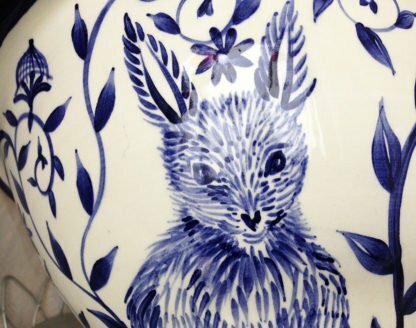 The outside may be ordered with the garden design or in a garden rabbits design. This has two rabbits, one sitting, another hopping with vines and flowers flowing around them. Please specify which exterior you prefer when you order along with noting the bride/groom/wedding date info. On the inside the floral design surrounds two birds facing one another. This signifies a happy marriage and love that grows. The vines form a heart and a single acorn hangs over the two love birds. The acorns stand for the beginning seed of a long, strong marriage. 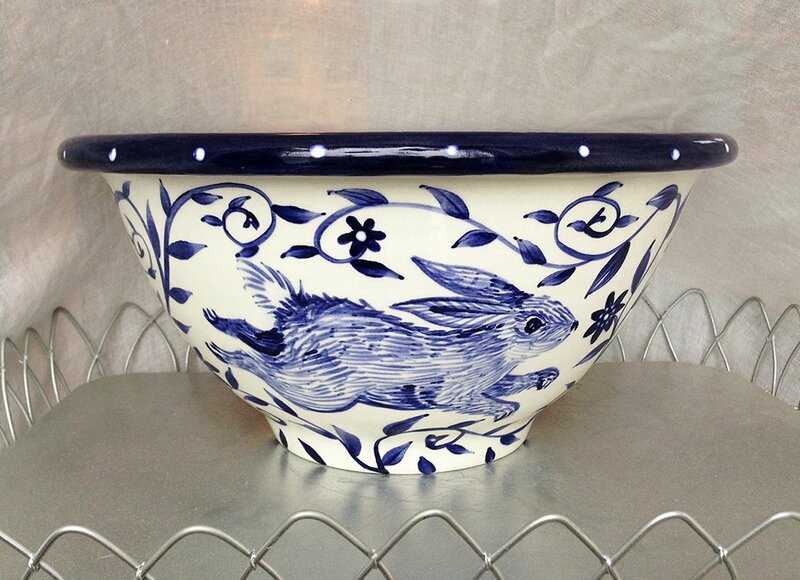 Bowl is about 13 inches across by 6 inches deep- excellent for salad, pastas or a pile of fruit. All our dinnerware is Food safe. Choose a complimentary Gift Card from my designs. There is a Happy Nest card, along with a “bloom together” heart card and other wedding or anniversary appropriate cards. I am happy to personalize a bowl for you with the bride and groom’s first names and wedding date. Or submit any other short phrasing you might like on the bottom of the bowl. Collect matching ceramic dinnerware in your custom wedding bowl Happy Nest pattern. 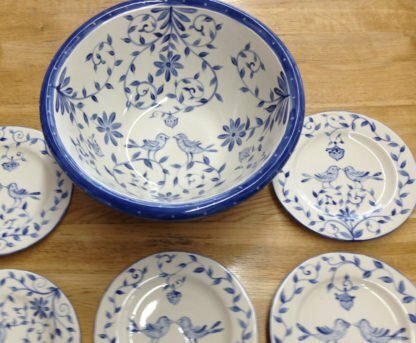 Collect matching ceramic dinnerware for the wedding bowl Happy Nest delft blue birds pattern. 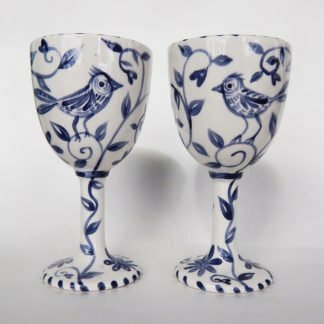 Give complimentary pieces such as the “Happy Nest” platter, wedding goblets, or other dinnerware to match the serving bowl. 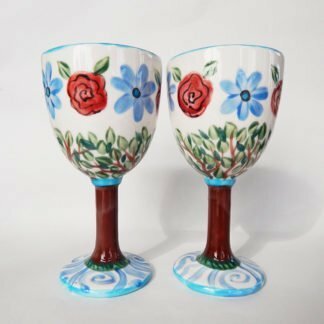 Our collectable custom dinnerware can be given at the wedding shower, wedding or on subsequent anniversaries.